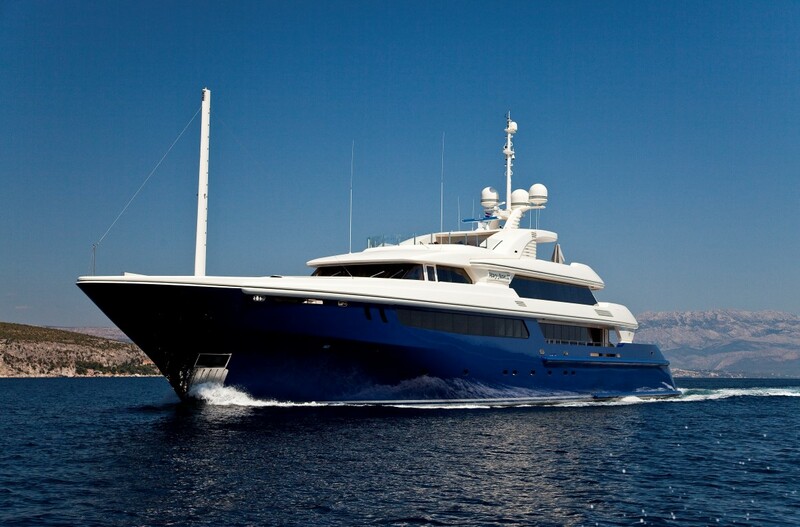 Built by ISA in 2010 with naval architecture also by the shipyard, the 62m/203ft luxury superyacht has exterior styling by Walter Franchini Architetto and interior styling from Mark Berryman. The vessel sleeps up to 12 charter guests over seven beautiful staterooms, and offers a luxurious and adventure-filled yacht charter experience. The lower deck swim platform connects up to the main deck aft, where there is a plush sofa along the stern. Two elongated sofas and coffee tables with a navy blue, white and cream colour scheme are placed close to the doors to the main salon and create a casual outdoor lounge ready for use day or night. The upper deck aft has integrated seating in each corner of the stern and beneath the sundeck overhang is a grand alfresco dining table to seat 12 guests and a corner bar. The foredeck has a seat in front of the helm station where guests can spend a few quiet hours enjoying a drink and the scenery. Up on the sundeck the stern has an expansive sunpad while a casual seating area is built into the port side and the central section has an oval alfresco dining table to seat 10. The forward bar is perfectly positioned to serve refreshments throughout the meal and for guests soaking in the forward Jacuzzi before drying off on the sunpads. The lower deck contains a tender garage each side of the beach club and side hatches allow for easy launch and retrieval. Forward of the engine room is the guest accommodation, consisting of two double cabins and two twin cabins, all with en-suite facilities. The bow section is dedicated to the crew facilities and accommodation. 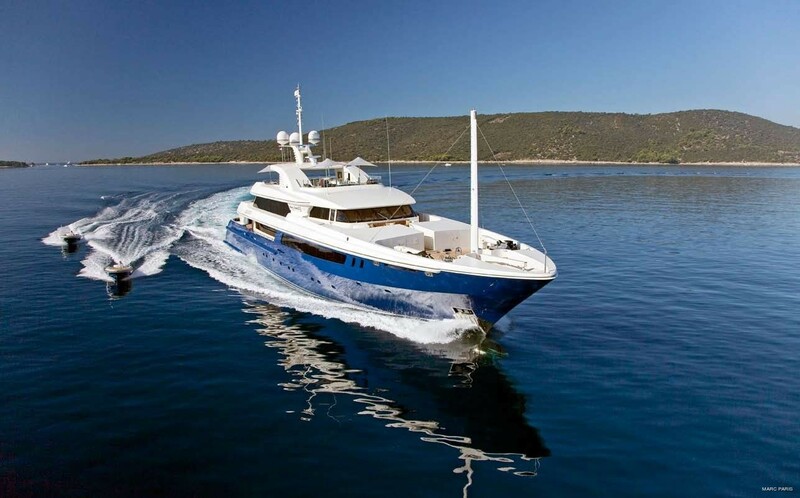 The main deck forward contains the full-beam Master suite with an en-suite bathroom with a tub and walk-in wardrobes. Behind the Master suite is a double cabin convertible to a twin. To the aft, the main salon and formal dining area form one large area and the latter section seats up to 14 guests in beautiful contemporary surroundings with a geometric theme. Lighting flows from the formal dining area to the main salon, where wall sconces and table lamps show off the large artwork at its best. Two elongated sofas are placed beside the port and starboard windows, with a further sofa forward to create an intimate lounge where guests can converse or watch a film together on the widescreen TV. 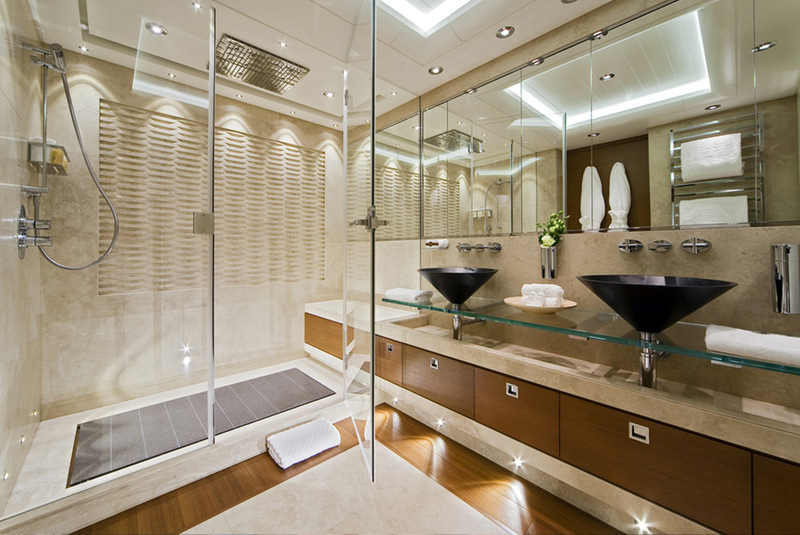 The upper deck hosts the VIP stateroom with its own en-suite bathroom and walk-in wardrobe. To the aft, the sky lounge has an uplifting colour scheme using primary-coloured accents against cream furnishings. The massive widescreen TV and high-quality audio-visual systems create the perfect cinema setting while guests stretch out on the elongated sofa. Alternatively, guests can play at the games table while the forward bar provides refreshments throughout the evening. A pair of Caterpillar 3512 engines provides a cruising speed of 13 knots. The guest accommodation sleeps a maximum of 12 guests across 7 cabins: 1 Master suite, 1 VIP stateroom, 3 double cabins and 2 twin cabins plus 2 additional convertible cabins, each with a Pullman berth. The crew of 16 will ensure that everyone on board receives the first-class service throughout the entire yacht charter holiday. We do have available further amenity, owner and price information for the 61.70m (202' 5") yacht 62M LUXURY SUPERYACHT , so please enquire for more information.